There is a longer list of recalls this week and most of them are for technicians who service buses and large trucks. The recalls that directly pertain to glass replacement include the Mack truck, Ford Transit Connect, Taurus/MKS and the Nova Bus exit window. The others are good to know and good to warn your customers about. Check out these potential issues when you are working on these vehicles and make sure everything is working properly. If the fix will mean the dealer must get involved, urge the customer to visit the dealership to have the repairs done. Mack Trucks, Inc. (Mack) is recalling certain model year 2015 Mack LEU trucks manufactured March 31, 2014 to December 12, 2014. In the affected vehicles, a component of the door opening mechanism may be too short and as a result, the door may not be able to be opened by someone inside the truck. If the door cannot be opened from the inside, egress from the vehicle could be hindered which would increase the risk of injury in the event of an emergency. Mack will notify owners and dealers will replace the inner door latches, free of charge. The recall is expected to begin March 26, 2015. Owners may contact Mack customer service at 800/528-6586. Mack’s number for this recall is SC0388. Ford is recalling certain model year 2014 Ford Transit Connect vehicles manufactured November 6, 2013 to September 20, 2014. In the affected vehicles, the upper seat belt bolts may have been improperly torqued, allowing them to loosen over time. Ford will notify owners and dealers will replace the original seatbelt fasteners with properly torqued fasteners, free of charge. The recall is expected to begin March 23, 2015. Owners may contact Ford customer service at 866/436-7332. Ford’s number for this recall is 15S03. Ford is recalling certain model year 2010-2013 Ford Taurus vehicles manufactured December 1, 2009 to July 31, 2010, and 2011-2013 Lincoln MKS vehicles manufactured June 1, 2011 to October 31, 2011. In the affected vehicles, the interior door handle return spring may unseat, resulting in interior door handle that does not return to the fully stowed position after actuation. Ford will notify owners, and dealers will inspect all four of the interior door handles and either repair or replace them, free of charge. The recall is expected to begin March 16, 2015. Owners may contact Ford customer service at 866/436-7332. Ford’s number for this recall is 15S02. Nova Bus (Nova) is recalling certain model year 2006-2007 LFS transit buses manufactured January 1, 2006, to December 31, 2007. In the affected vehicles, the rear exit door controls may not function properly. If the rear exit door does not open and close as expected, there is an increased risk of injury to bus occupants. Nova notified owners, and dealers corrected the exit door control programming, free of charge. Owners may contact Nova customer service at 450/472-6410. Nova’s number for this recall is CR1300. An emergency exit that is difficult to open may hinder egress in the event of an emergency, increasing the risk of injury. Nova has notified owners, and dealers removed any material that restricted the opening of the emergency exit, free of charge. 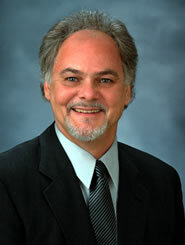 Owners may contact Nova customer service at 450/472-6410. Nova’s number for this recall is CR1314. Jaguar Land Rover North America LLC (Land Rover) is recalling certain model year 2013-2015 Land Rover Range Rover vehicles manufactured August 23, 2012 to February 5, 2015, and 2014-2015 Range Rover Sport vehicles manufactured June 16, 2013 to February 5, 2015. In the affected vehicles, a light weight adult front seat passenger may be improperly classified by the occupant classification system (OCS) and, as a result, the front seat passenger air bag may be disabled. Land Rover will notify owners and dealers will update the OCS software, free of charge. The recall is expected to begin April 17, 2015. Owners may contact Land Rover customer service at 800/637-6837. Land Rover’s number for this recall is P059. How Does Cadillac’s Intelligent Collision Avoidance System Impact Us? Cadillac has developed one of the most sophisticated collision-avoidance systems in the industry called Intelligent Collision Avoidance System (ICAS). This is an Advanced Driver Assistance System (ADAS), and while it is sophisticated, it is the easiest to deal with as an automotive glass technician. For an interesting article that explains the features above, click here. Now you tell me, how can a system like the one described above, using multiple methods of collecting data and combining that information to accomplish 13 different actions, not require calibration? Good old fashioned American ingenuity I guess. My local Cadillac service manager, quoting from the service manual, says there is no need to recalibrate the system for normal windshield replacement as long as the camera is mounted properly. The only need for calibration is if the camera itself is replaced. He also notes that the vehicle may need a road test to check the system. The vehicle will need to be driven on a well-marked roadway with a centerline and lane line. I recently read that these Cadillacs must be driven at 45 mph on a well-marked highway and continue to be driven until the light goes from an amber color to green. This is a variation in criteria from the service manual I saw (from light illumination ending to a color change). However, there may be differences due to model or year of the vehicle, so be sure to check the manual for the car you are working on. I would highly recommend that the technician check the lights before and after installation and see if the light indicator proves proper operation. If not, drive the vehicle at 45 mph on a nearby highway and see if that will self-calibrate the system. Also remember that the system can be turned off and on by the driver so make sure it is activated before checking operation. This installation is one that is easier to deal with than some of the others because a third party is not necessary to complete the installation. Yes, the camera is windshield mounted. And, yes, it is a sophisticated safety system; however, recalibration is not necessary unless the lights indicate improper operation. If the light does not change color or go out completely, take the vehicle to the nearest dealer for troubleshooting. See, there is some good news once in a while. 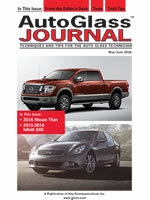 I got my new National Auto Glass Specifications catalog (NAGS, which is a part of Mitchell International) recently. Yes, I still buy the printed catalog. I would not categorize a NAGS catalog as a good evening reading before bed, but I thought it would be interesting to see what was new. Little did I know that there was a pretty good list of items that were new to me, though not necessarily brand new. So I thought I would begin a series of posts on new technology, or features other than those Advanced Driver Assistance Systems (ADSD), which need calibration. 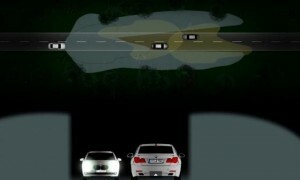 The first one on the list is BMW’s Intelligent Headlight Technology (IHT). By definition this is an ADAS but it does not need recalibration every time the windshield is replaced. The windshields that come with the new IHT is the FW3892, 3970, 4034. 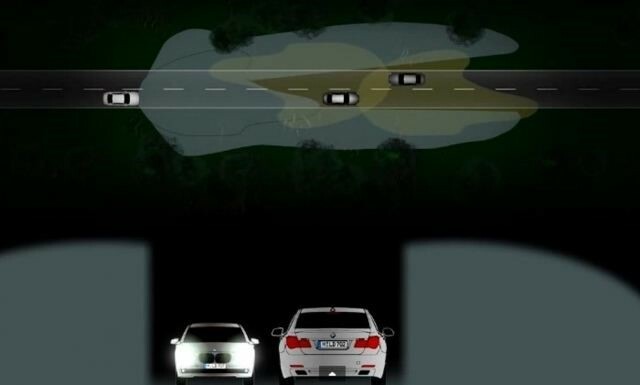 It is a technology that combines BMW’s adaptive headlights and high-beam assistant. 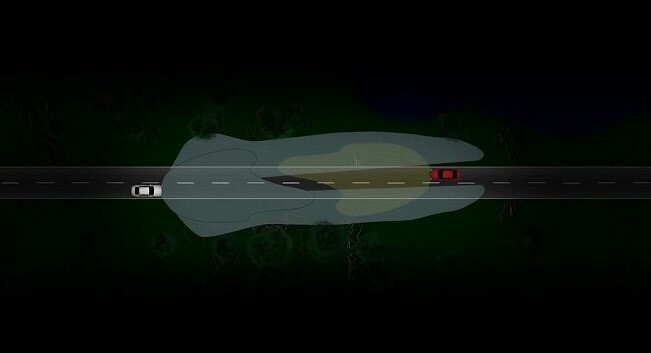 These two systems work together to reduce glare and heighten visibility on dark or weather-limited roadways. The cool part is that the feature does this without blinding the oncoming traffic or the vehicles immediately ahead of you. It automatically adjusts the light beam to literally wrap around the oncoming and preceding vehicles. Take a look at a video about this by clicking here. The camera for this technology is mounted near the rearview mirror much like other ADAS systems. However, do not confuse the intelligent headlights with a lane departure camera or other ADAS cameras. The vehicles equipped with IHT are not equipped with any other driver-assist systems which need recalibration. The camera is only for the headlights and the performance of the headlights is not considered a safety system as we define it. If the system makes the lights go out then that is a definite safety system malfunction; however, the driver can switch to manual headlights. This technology should not make a big difference in how you install the glass, but it will make a difference in which glass part you order. Hopefully your customer will know if they have this additional equipment. Unfortunately, there is no easy way to determine if the vehicle is equipped with the headlight system or with other ADAS. You can’t simply ask if there is camera mounted to the glass because both systems have cameras. Ask your customer if they have the BMW Visibility Package or obtain the VIN to determine which one they have. That should give you the answer you need to order the part correctly.